We posted once about NuSTAR, a new X-ray telescope. It was due to be launched in March, but that launch date is now scheduled for June. 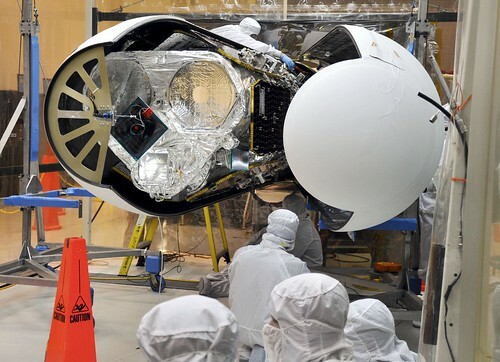 Below is a great new image of NuSTAR in the nose cone of the Pegasus rocket it will be launched on. 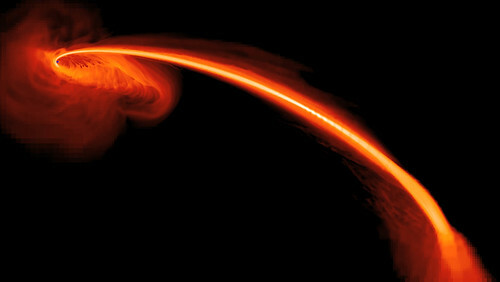 Using NASA’s Galaxy Evolution Explorer, a space-based observatory, and the Pan-STARRS1 telescope on the summit of Haleakala in Hawaii, astronomers have gathered the most direct evidence yet of a supermassive black hole shredding a star that wandered too close. If you haven’t, check out Goldpaint Photography for some amazing astronomical images. This image of the night sky in Norway is also stunning – it shows the Milky Way and the Northern Lights running in parallel lines down the sky. Gorgeous! In other eye candy news, check out this gorgeous video by Sander van den Berg, featuring Saturn, which uses image sequences from NASA’s Cassini and Voyager missions. 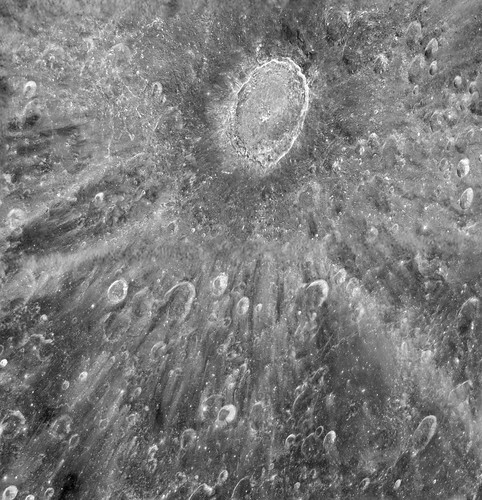 This lovely image of the Moon was captured by the Hubble Space Telescope – it shows the crater Tycho. However, it was taken for an interesting reason – in preparation for the transit of Venus across the Sun’s face on on the 5th of June, 2012. Hubble cannot look at the Sun directly, so astronomers are planning to point the telescope at the Moon and use it as a mirror to capture reflected sunlight. A small fraction of the light from the sun will have passed through Venus’s atmosphere during the transit; imprinted on that light astronomers expect to find the fingerprints of the planet’s atmospheric makeup. These observations are similar to a technique that is already being used to learn about the chemical composition of the atmospheres of giant planets outside our Solar System passing in front of their stars. We already know the chemical makeup of Venus’s atmosphere, and that there is no life on the planet. But it’s a good way to test how well this technique will work for detecting the very faint fingerprints of the atmosphere of an Earth-like planet around another star. 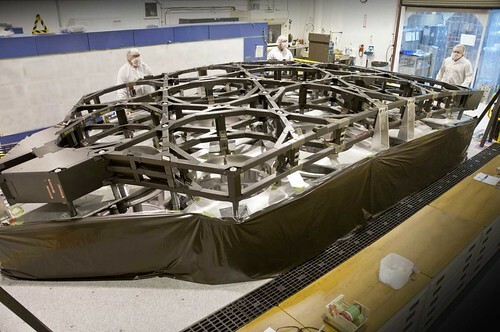 Another milestone met on the road to building the James Webb Space Telescope. The center section of the backplane structure has been completed! The backplane will support the telescope’s beryllium mirrors, instruments, thermal control systems and other hardware, serving as a sort of “spine” for the telescope. This gorgeous Hubble image of the Egg Nebula shows a specific period of the life cycle of a star, when it runs out of nuclear fuel, known as the preplanetary or protoplanetary nebula stage. Planetary nebulae actually have nothing to do with planets. Over a few thousand years, the hot remains of the aging star in the center of the nebula heat it up, excite the gas, and make it glow – this type of nebula is called a “planetary” nebula. Pictured here, though is a preplanetary nebulae – this phase of a star’s life is relatively brief, which means there are relatively few of them in existence at any one time. They are also very dim, requiring powerful telescopes to be seen. Being rare and faint means they were only discovered recently. (The Egg Nebula, shown here, was the first to be discovered, and was spotted for the first time less than 40 years ago.) This class of object remains a bit mysterious as a result. At the center of this image, and hidden in a thick cloud of dust, is the nebula’s central star. 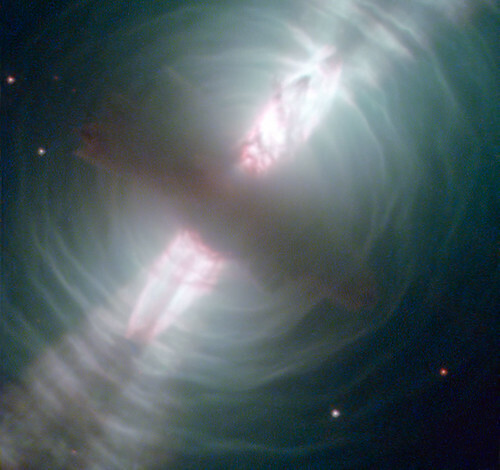 Four “searchlight” beams of light coming from it shine out through the nebula. It is thought perhaps jets coming from the star carve ring-shaped holes in the thick cocoon of dust, letting the beams of light emerge through the otherwise opaque cloud. How the stellar jets produce these holes isn’t known for certain, but one possible explanation is perhaps that a binary star system, rather than a single star, is at the center of the nebula. The onion-like layered structure of the more diffuse cloud surrounding the central cocoon is caused by periodic bursts of material being ejected from the dying star. The bursts typically occur every few hundred years. Read more at the NASA feature article. Credits: Left image – Optical: ESO/VLT; Close-up – X-ray: NASA/CXC/Curtin University/R. Soria et al., Optical: NASA/STScI/Middlebury College/F. Winkler et al. 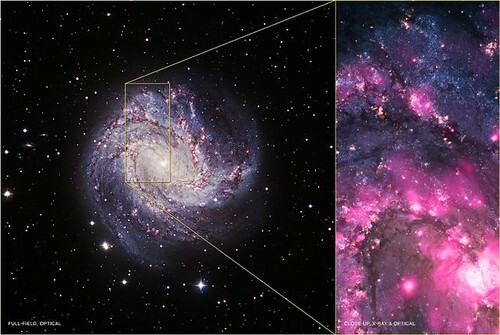 Using NASA’s Chandra X-ray Observatory, astronomers discovered an extraordinary outburst by a black hole in the spiral galaxy M83. This black hole is what is known as a ultraluminous X-ray source (ULX) – that is objects that give off more X-rays than most “normal” binary systems in which a companion star is in orbit around a neutron star or black hole. The observations, made over several years, showed that the ULX in M83 increased in X-ray brightness by at least 3,000 times. This sudden brightening is one of the largest changes in X-rays ever seen for this type of object, which do not usually show dormant periods. You can read more about this object at the NASA feature about it.